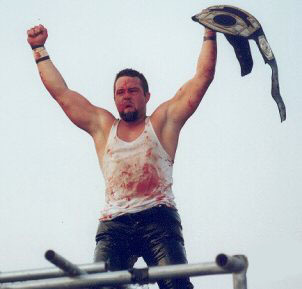 Derek Domino February 13th, 1999 Domino was awarded the title on the first CZW show (CZW Opening Night). Lobo February 13th, 1999 Lobo defeated Domino to win the title on the very same show (CZW Opening Night). Wifebeater(2nd) July 22nd, 2000 Pondo was stripped of the title. Wifebeater was awarded the title at CZW No Rules, No Limits. LuFisto August 12th, 2006 LuFisto was forced to vacate the title in January '07, due to a severe back injury. DJ Hyde February 10th, 2007 Hyde became champion by winning a "Three Way" Match over Adam Flash and Chris Hero. Egotistico Fantastico June 13th, 2009 Fantastico ended up being the final champion. The Iron Man Title was retired on 7/11/2009.